A few months ago, I discovered Myth on social media and set out to find the cafe. I was pleasantly surprised, and have made a point to go back time and time again. Minimalist in design, the cafe features naked concrete walls and black metal tables. 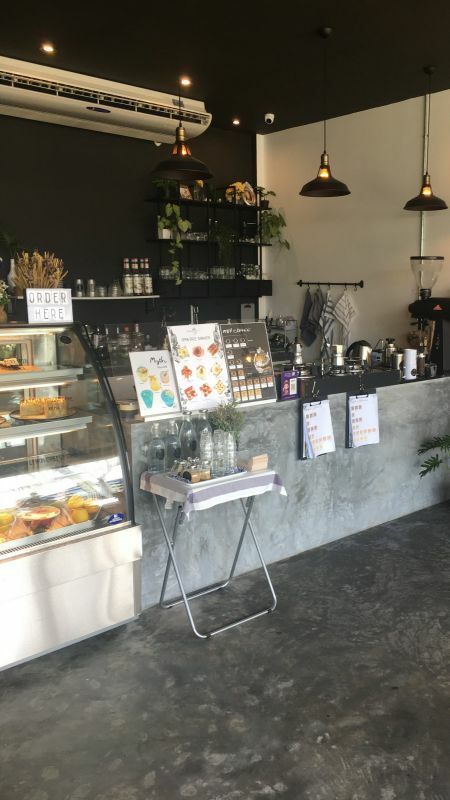 There is an overstuffed sofa for those who prefer a bit of comfort, while a variety of vintage coffee tables and general bric-a-brac add to the overall charm of the cafe. Another of the cafe’s alluring charms is the carefully placed succulents and large variety of palms and potted plants. The greenery adds a lovely touch and really gives Myth a cozy feel. The menu at Myth does not disappoint. 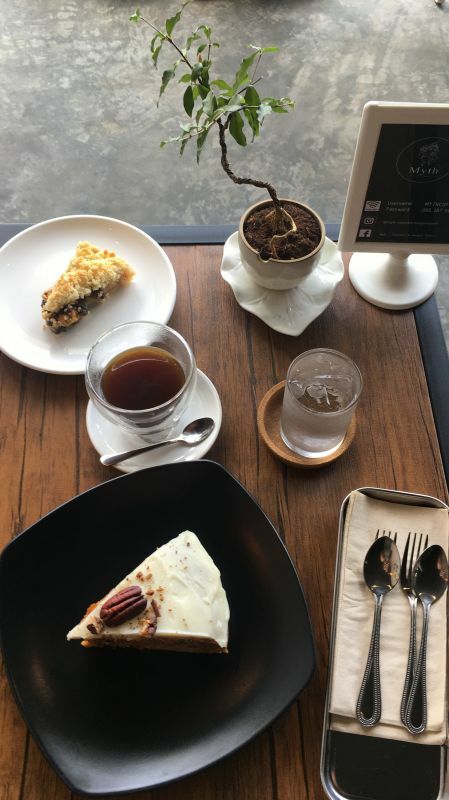 The coffee menu is extensive and includes all of the regular favourites such as Cafe Latte, Cappuccino, and Espresso while also having flavoured drinks as an option. If you are a tea lover, there are a variety of tea bags to choose from and also a few cold drinks such as Kombucha and Arabica Craft Soda. The cakes at Myth mean business and are guaranteed to satisfy any sweet tooth. The owner of the cafe is a talented baker, and offers up interesting goodies as well the occasional vegan treat, too! While I am partial to the Nutella Brownie, other scrumptious cakes on offer include the Lemon Cheesecake, the healthy Purple Sweet Potato Tart, the Cappuccino Cake, and the Apple Crumble. For those looking for something other than cake, there are a few toast offerings on the menu such as Hawaiian Chicken and Nutella Strawberry. There is always a nice soundtrack playing in the background at Myth. The cafe offers free WiFi, which as we all know, is a convenient bonus. There is a small garden out front with a few seats for those wanting to take advantage of the outdoors. However, if you are looking for a nice place to have a coffee break and perhaps get some work done, Myth is not to be missed. Myth is honestly just a really nice place. The owner is lovely, and the atmosphere is relaxed. Although it is often busy, the cafe does not have that overcrowded feel that many of Phuket’s coffee establishments have. Instead, the cafe feels welcoming and inviting. Do make a point to stop in at Myth when you are in the Chalong area! With the exception of Wednesday, Myth มิธ Coffee Bar & Hangout Space is open daily from 9:30 AM until 6:00 PM. For more information on the day’s cakes and menu, call 095 187 9146. Bookhemian Cafe in Old Phuket Town. A book lover’s haven.